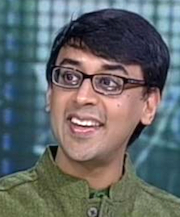 “India’s Math Genius Manjul Bhargava talks to NDTV (New Delhi Television) about his love for mathematics, and suggests that the teaching of math in India can be made fun and ‘less robotic’, using even magic tricks as teaching aids. 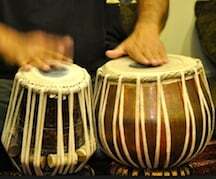 He also touches on the mathematical nature of the tabla and other forms of music. NDTV: Hello and welcome from me and from students all over India who are studying in the finest of colleges here in Delhi. We are all here together to do just one thing, to listen and learn from this bewildering genius Manjul Bhargava. Manjul is one of the greatest minds India has ever created. He has been awarded a prize, which I consider even greater than the Nobel Prize. Prof. Bhargava has recently won the Fields Medal in Mathematics. Why do I say its possibly even greater than the Nobel Prize, because this highest global award in Mathematics is given only once in every 4 years. How about a round of applause for this young gentleman and actually you will notice, as the evening goes on, that his majesty and simplicity is really truly Indian. Why do I call him a bewildering genus?” Read the rest of this article here.